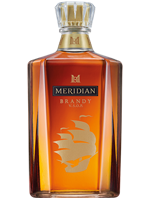 Meridian | Thai Spirits | International Beverage Holdings Ltd.
Meridian is our V.S.O.P brandy made by one of Thailand's finest producers, the United Winery & Distillery. Made from pineapples, it is distilled in a copper pot still imported from Cognac in France and then left to age in limousine oak for 4 years. It is then blended by Thailand's leading master blender. Our high quality brandy has been recognized internationally by winning a silver award from IWSC International Wine & Spirits Competition in 2017.